First time test taker study guide. Recurrent knowledge exam study guide. 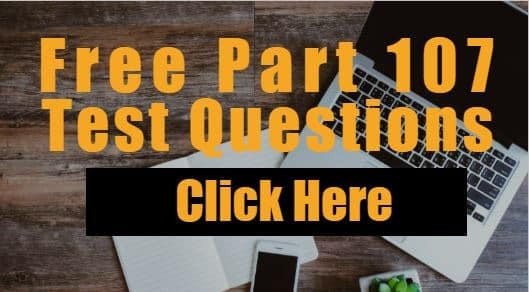 I created this free Part 107 test study guide to help my clients and the drone community based upon my experience as a FAA certificated flight instructor and aviation attorney. Keep in mind that many of the courses online are taught by people who are NOT FAA certificated flight instructors. Dig in and find out if a flight instructor teaches the WHOLE course. The FAA compiled a list of many references in the final airmen certification standards for the remote pilot knowledge exam and FAA created study guide. Unfortunately, they did NOT include everything you need or would find helpful. Below I have included the material the FAA suggested you study along with extra items that the FAA should have included, which are in the bold text, that I added. I want to emphasize, after you pass your test, you should be looking for quality mentorship for the long term. Being a professional is not just about passing a test. If you are looking to be mediocre, I suggest you go to another industry and do us all a favor. It should be about learning the material AND how to apply it properly in practice. Passing the Part 107 exam is merely the key unlocking the door to begin your journey into aviation, not a certificate saying you have arrived. To reemphasize, once you pass your test, go find a competent flight instructor who can help you apply the knowledge you will learn to real life situations so you can be profitable, legal, and safe. Disclaimer: You aren’t guaranteed to pass the test based off this material. Step 1. Read all the steps. Step 2. Sign up for the test. Instructions on signing up for the test getting your pilot license is here. You should pick a date based upon how much time you have in relation to how much material you need to go through. You are looking at around 538 pages of material you need to read. Yes, I know there are only 135 pages in THIS document. I reference pages in other documents below. Step 3. Learn about the Airmen Certification Standards (ACS) and read over the Part 107 ACS. Step 4. Start studying the material below. Step 5. Once you are done or feel competent. Take the test of 40 sample questions. For your deficient areas, go over those particular areas in the ACS. All 40 questions are answered and explained in this document in the back. Step 6. In the final stretch of time, study Area II and Area V from the ACS since both of those areas will make up 50-70% of the test. Step 7. After you passed your test, you should be looking for quality mentorship for the long term. Being a professional is not just about passing a test. If you are looking to be mediocre, I suggest you go to another industry and do us all a favor. It should be about learning the material AND how to apply it properly in practice. Now go find a competent flight instructor who can help you apply the knowledge you learned to real life situations so you can be profitable, legal, and safe. The FAA compiled a list of references in the final ACS and FAA study guide. Unfortunately, they did not include everything you need or would find helpful. Below I have included the extra items that the FAA should have included, which are in the bold text. 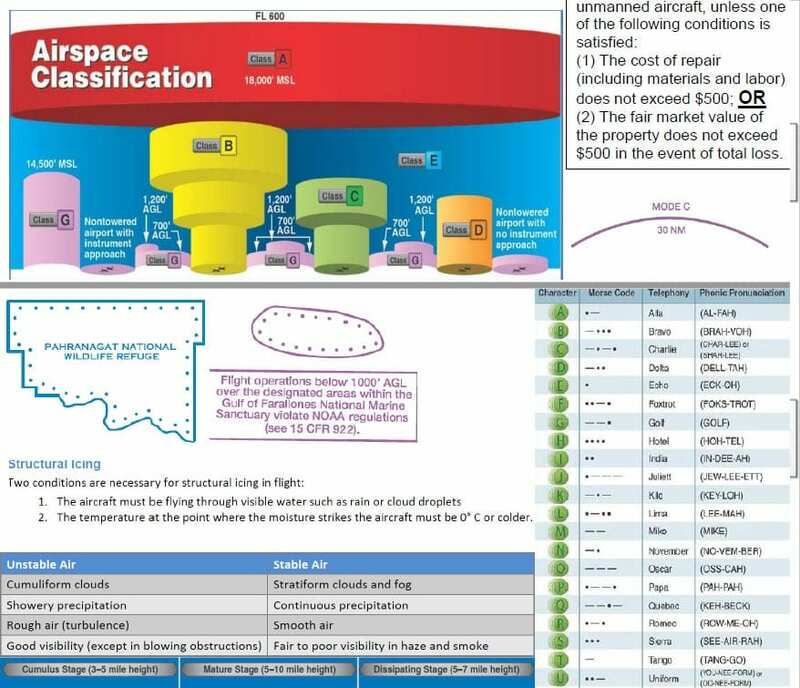 I find it interesting the FAA did not note anything about Part 830 (except for one small reference in a PLT code) or the NASA Aviation Safety Reporting System (ASRS). Both of those programs are focused on safety while the FAA’s accident reporting requirement in Part 107 is focused on safety and enforcement. A pilot needs to know both of these programs. I find it also interesting the FAA didn’t mention anything about the NASA ASRS which is there for the pilot’s benefit, not the FAA’s, regarding enforcement actions. Let that sink in for a second. This shows the importance of why you need to have a good aviation attorney in your corner to look after you, as the FAA won’t. Read What Do I Do After I Crash My Drone? The total number of regulations and pages is very large. I chopped it up into what pieces of material you should know in entirety and what you should pick pieces and parts of based upon the ACS. The total test will be 60 questions and you will have 2 hours to complete it. The minimum passing score is 70% which is a maximum of 18 questions wrong or a minimum of 42 questions right. If there are any errors or broken links in here, for the greater good of everyone studying, let me know so I can correct it and inform everyone. Part 107 Test Tip – USE THE SUPPLEMENT LEGEND! A bunch of the questions on your test will be answered right by the legend in the supplement. You CAN refer to this while in the test. Make sure the test proctor gives you the correct one that is up to date prior to going into the test. I heard one horror story where the person had an old one so the questions didn’t match up. Make sure you have a current one! Always keep in mind how the answers can answer OTHER questions. If you don’t know the answer, or eliminate the wrong ones, keep moving on. Sometimes the questions and answers further down will provide you the answers to the one you are having trouble with. When I took the test, I noticed that there were two questions that were very similar in topic. One of the questions had two really dumb answers which basically gave away the correct answer. If you knew nothing about the topic, just using common sense to eliminate the two bad answer, you could have used the correct answer to answer the first question. Brain dump everything immediately onto your scrap paper when you start the test. You want to write down everything you think you will forget on the scrap piece of paper. Just dump it all out and any pictures and diagrams you have up in your head. Try and answer the question BEFORE you read the answers so you don’t get tricked. The FAA likes to create answers where one is a slight “one-off” from the correct answer. By reading the answers, you can introduce doubt. For example, Federal Aviation Administration or Federal Aviation Agency? Which is it? They both seem like good answers. Is it MSL or AGL? Eliminate the wrong answers. You don’t have to find the correct answer, just the wrong ones. Read the test question AND answers carefully. I cannot over emphasize this. Sleep and eat well. I would just sleep 8-10 hours. Take the test around 10AM-12PM. This way you aren’t rushed and can miss rush hour traffic as you drive there. When I was in law school (3-4hour exams) and taking the Florida bar exam (2 full 8 hour days), I had to make sure my body wouldn’t go out on me. I would eat very greasy foods right before I would go in so I wouldn’t be hungry while I would take a Kombucha vitamin B shot right. Check with your doctor to make sure this is ok with you. The vitamin B would start metabolizing by the time I took the test or started answering questions. You will be able to take the test with the Airman Knowledge Testing Supplement for Sport Pilot, Recreational Pilot, and Private Pilot which is a great resource. There are two reasons why you should look for this supplement and know what is in it: (1) there are helpful legends which will be great for answering sectional map questions and (2) many questions on the test will reference some of the figures in this supplement. At the end of your studying, you should skim through and ask yourself questions based on the numbered areas on the sectional charts. See a term you don’t know in the ACS? Look it up in the glossary of the Pilot’s Handbook of Aeronautical Knowledge (PHAK) to see what the term means in a short statement. Want to learn more about the term in the ACS? Look up the term in the index of the PHAK and/or Aeronautical Information Manual (AIM) which will tell you where to find more information. Hit ctrl + f and type in the word to search through the PDF rapidly. All of the study material below is free. Good News! Studying for the Part 107 exam can be FREE! 14 CFR part 73 [this should have been in there] SPECIAL USE AIRSPACE (Restricted and Prohibited Airspace). · 91.19 Carriage of narcotic drugs, marihuana, and depressant or stimulant drugs or substances. · 91.137 Temporary flight restrictions in the vicinity of disaster/hazard areas. · 91.138 Temporary flight restrictions in national disaster areas in the State of Hawaii. · 91.139 Emergency air traffic rules. · 91.141 Flight restrictions in the proximity of the Presidential and other parties. · 91.143 Flight limitation in the proximity of space flight operations. · 91.144 Temporary restriction on flight operations during abnormally high barometric pressure conditions. · 91.145 Management of aircraft operations in the vicinity of aerial demonstrations and major sporting events. · 91.203(a)(2) Civil aircraft: Certifications required. 14 CFR 99.7 § 99.7 Special security instructions. · Winds / Currents (Chapter 7 – 6 pages) (Chapter 9 – 9 pages) (Chapter 10 – 9 pages). · Density Altitude (Sections 5.3 through 5.5 – 6 pages). · Know how to use the two legends. Pages 1-19. This supplement will be provided to you when you take the test. If they do not, ask for it. Read Page 7 of this FAA document for proof. · Figure 2 – Know how to use. · Figure 12- Decode these and study them. You should know how to read these for the real world, not just memorize these so you can pass the test. · Figure 13 – You should read over this and know what information is important for you as a drone pilot and what is not. · Figure 15 – This is important to know so you can plan operations. · Figure 55 – Picture 3 and 7. This is how pilots dance at parties. After the party, if you ever have a flag and you need to hide it so it doesn’t get stolen at an airport, a great place to hide it is under the tail of an airplane. See Picture 4. Step 1. Read all the steps. Understand this is for the recurrent exam, NOT the initial exam. That is another study guide on my website. Step 2. Figure out when you need to take the test by. See the section below talking about when aeronautical knowledge currency expires. Step 3. Sign up for the test. Instructions on signing up for the test is here. You should pick a date based upon how much time you have in relation to how much material you need to go through. You are looking at around 335 pages of material you need to read. Yes, I know there are only 138 pages in THIS document. I reference pages in other documents below. Step 4. Learn about the Airmen Certification Standards (ACS) and read over the Part 107 ACS. Step 5. Start studying the material below based upon what was listed in the ACS regarding the recurrent knowledge exam. Step 6. Once you are done or feel competent. Take the test of 40 sample questions. For your deficient areas, go over those particular areas in the ACS. All 40 questions are answered and explained in this document in the back. Keep in mind that some of those questions are on things that won’t be on the recurrent exam such as weather. You might want to skip those questions or take a crack at it to see if your knowledge is still good. Step 7. 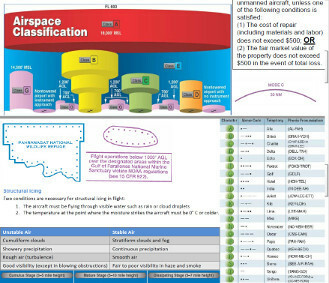 In the final stretch of time, study Area I (the regulations) and Area II (airspace & chart reading) from the ACS since both of those areas will make up 60-80% of the test. 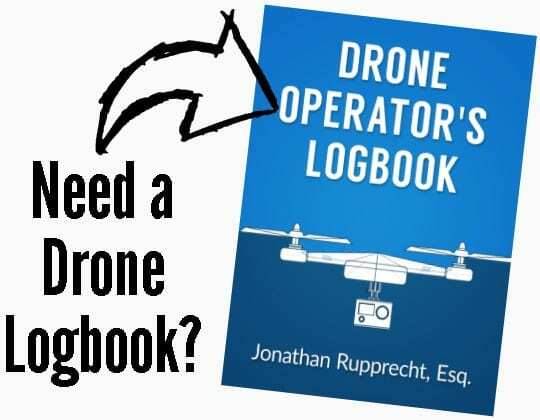 Maybe go through the 107 regulations paid video course at Rupprecht Drones with 100+ questions? The recurrent knowledge exam will be 40 questions and you will have 1.5 hours to complete it. The minimum passing score is 70% which is a maximum of 12 questions wrong or a minimum of 28 questions right. If there are any errors or broken links in here, for the greater good of everyone studying, let me know so I can correct it. You need 1 of the following within the previous 24 calendar months to operate under Part 107; however, if you don’t meet this, you are grounded from flying under Part 107 but you still could fly recreationally under Part 101. Does your remote pilot certificate expire? No, you don’t lose your remote pilot certificate. It really shouldn’t be termed recertification as you are NOT getting a certificate again or having to worry about losing the certificate. You just cannot exercise the privileges of the remote pilot certificate. Everyone typically gets confused by what I just said. I’ll give you some examples. Bob passes an initial aeronautical knowledge test on September 15, 2016 and received his remote pilot certificate. This means Bob needs to do (a),(b), or (c) no later than September 30, 2018. Otherwise, he’ll have to stop flying under Part 107 until he does (a), (b), or (c). Tony passed the exam with Bob on September 15, 2016. He received his remote pilot certificate. He did not take the recurrent exam until October 10, 2018 and passed in the afternoon at 1:34PM. Tony could not fly from October 1-10 up till he passed the test around 1:33-34PM. Once he passed, he was good to go for another 24 months (October 31st, 2020 @ 11:59 PM). Sam, who also passed with Bob and Tony on September 15, 2016, received his remote pilot certificate but didn’t really do much drone flying because of life circumstances. He managed to pass the recurrent knowledge exam on December 14, 2019. He is good until December 31st, 2021. Important point. Please note that when calculating recency, you are going off of when you did (a), (b), or (c) above, NOT when you received your remote pilot certificate or what is dated on your certificate. I lost my knowledge test report. How do I figure when my currency expires? Dig into your emails to see if your have a test payment or schedule confirmation with some date attached. You might want to try this email ([email protected]) if you went with CATS. Another thing to do is look into your calendar and see if you put it in there. If the date is fuzzy, try to at least figure out the month you took it in. Currency runs out on the last day of that month 24 months later. Maybe call CATS or Lasergrade customer support and ask them when you took your previous test and while you are on the phone just book the recurrent exam. How do I check if someone else is current? You would think the FAA would have just put expiration dates on the remote pilot certificates like they do with my flight instructor certificate but no. If you search the FAA airmen registry, you’ll just see date of issue but not when currency expires. Method 2: their Part 61 pilot certificate (but not student pilot certificate), how they meet the flight review requirements of 61.56, AND their initial or recurrent online training course certificate. You find the date in method 1 or 2. You add two years and then find the last day of the month. It is important to know this as there might be some scam artists out there trying to save $150 by not taking a knowledge exam and hoping people don’t check. Dude are you saying I should bring along my knowledge exam with my remote pilot certificate with me when I fly? Well, it is a good idea in case that someone you are dealing with also read my article and wondering if you really are current. Now you might have noticed that you can take the initial or recurrent knowledge exams. The initial knowledge test is 60 questions over 2 hours while recurrent is 40 questions over 1.5 hours. They both require a passing score of 70% and will cost $150 to take. Here is a table I created for the online video training course on Part 107 being sold over at Rupprecht Drones. The percentages of questions on topics have changed also. Let’s dive into the three areas to see what is covered. All of Area I (Regulations) and Area II (Airspace & Requirements) are on the recurrent exam. Nothing from Area III (Weather) or Area IV (Loading & Performance) is on the exam. Area V (Operations) is mixed. You will be able to take the test with the Airman Knowledge Testing Supplement for Sport Pilot, Recreational Pilot, and Private Pilot which is a great resource. The test center should provide you a copy. You can’t bring your own. There are two reasons why you should look over this supplement and know what is in it: (1) there are helpful legends which will be great for answering sectional map questions and (2) many questions on the test will reference some of the figures in this supplement. At the end of your studying you should skim through and ask yourself questions based upon the numbered areas on the sectional charts. See a term you don’t know in the ACS? Look up the term in the index of the PHAK and/or Aeronautical Information Manual (AIM) which will tell you where to find more information. USE THE SUPPLEMENT LEGEND! A bunch of the questions on your test will be answered right by the legend in the supplement. You CAN refer to this while in the test. Make sure the test proctor gives you the correct one that is up to date prior to going into the test. I heard of one horror story where the person had an old one so the questions didn’t match up. Make sure you have a current one! Eliminate the wrong answers. You don’t have to always find the correct answer, just the wrong ones. Sleep and eat well. I would just sleep 8-10 hours. Take the test around 10AM-12PM. This way you aren’t rushed and can miss rush hour traffic as you drive there. Having Trouble Learning the Material? I’ve been creating online training courses for the sister company Rupprecht Drones. –Part 107 Regulations Online Training Course (test prep, waiver compliance, recurrent training, etc.) 40 videos and 35 quizzes totaling to over 100 questions for the entire course! –Night Operations Online Training Course for the Night Waiver. This is the training needed to fly under the Part 107-night waiver. It consists of 8 videos and 8 quizzes. If you pass it, you print out the certificate and keep it for your records in case the FAA audits you. This is Part of a Part 107 Series of Articles. ← EPIC v. FAA, Drone Advisory Committee RTCA, & more.